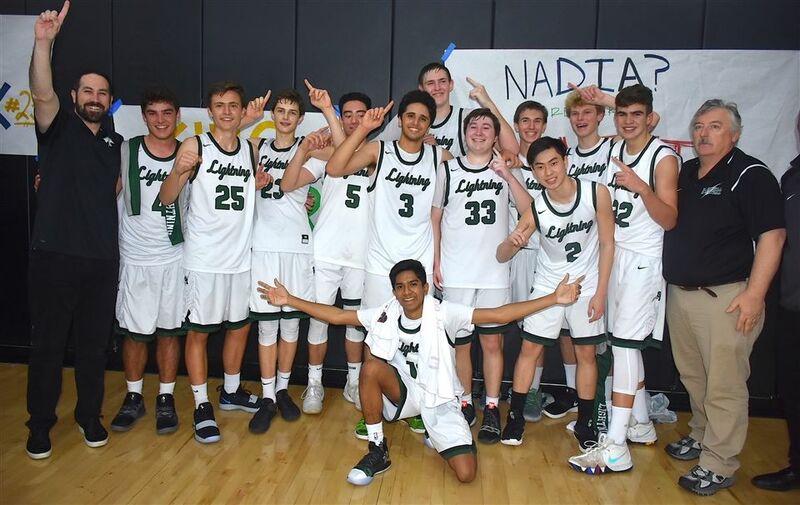 The boys’ varsity basketball team claimed its first league championship in school history after defeating rival St. Margaret’s, 63-57, on January 31. The team played in front of packed and spirited home crowd, which earlier in the evening watched the girls’ basketball team also beat St. Margaret’s to clinch third place in their league and a playoff spot. “We have battled with St. Margaret’s over the years in the spirit of healthy rivalries and we knew that this was the night we had a chance at victory, and we took advantage of the opportunity,” said Athletic Director Megan Cid. “We came out in full force, showing our Lightning pride both in action and in cheers. It was a special night all around -- especially for the seniors on both teams, who were celebrated during Senior Night. Nadia Akbari was heralded as the sole senior on the girls’ team. The senior boys were Alex Desbans, Johnny King, Darius ShayanSmith and Jack Strohman. With this latest victory, the boys’ team’s overall record goes to 18-10, with a 7-1 record in the Academy League. Their next game will be against CAMS at home in the Ube for the CIF-SS 1st Round on Friday, February 8.